See here for the original Spanish. For source of image see link. 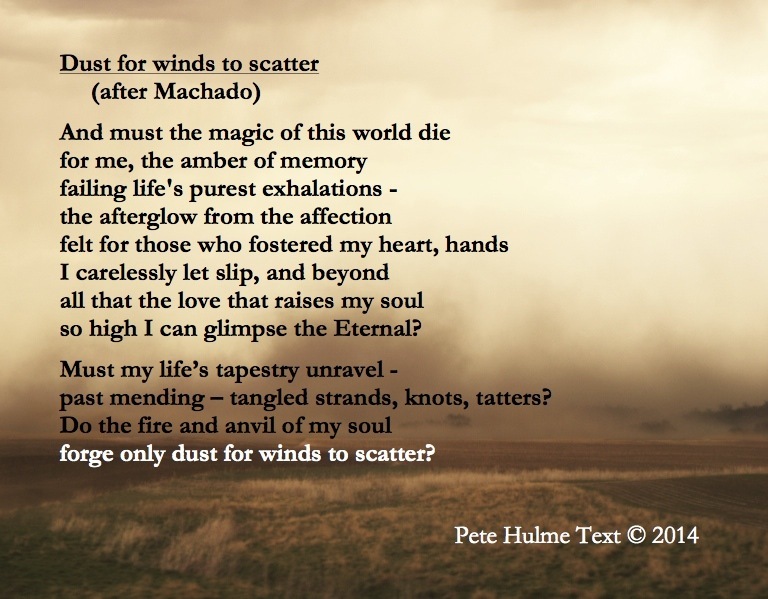 Pete, this is a stunning poem filled with all the heart and anguish of one who has loved truly and deeply. This is a poem that aches so perfectly that it is not possible not to ache with it. I have read an English translation of the original and I think you have added two elements that are your own: that the love you have born, being human, you have not born perfectly but that still it has transformed you enough to glimpse the mercy of the Divine. Beautiful and worthy sentiments they are too. I suspect that Antonio Machado feels that way too. John, your encouraging comments are deeply appreciated. You had clearly given careful thought to what you wrote. It’s hard to believe that I really might have managed to create in English something like the impact the poem made on me in Spanish because the original is so plangent, so powerful, so deeply felt.